Dreams, memories and cinema collide in Chinese director Bi Gan’s second feature Long Day’s Journey Into Night, a hypnotic and transfixing neo-noir that eschews a traditional narrative structure in favour of deep symbolism and metaphor. 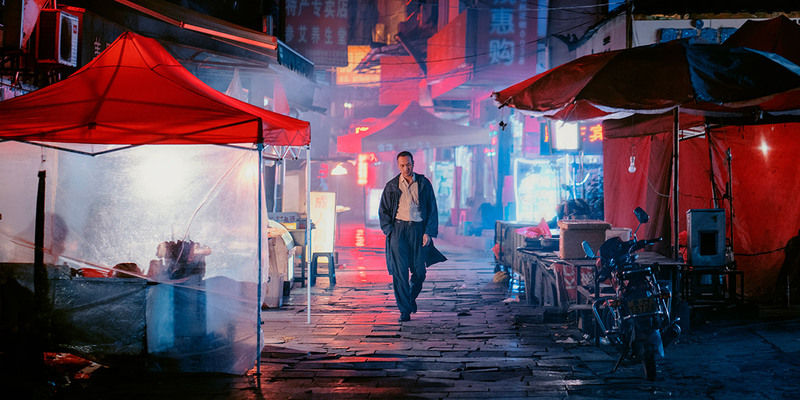 The film follows Luo Hongwu (Huang Jue), a man who returns to his hometown of Kaili after his father dies, and spends the night immersed in a world of memories and dreams as he reminisces on his past life as a gangster, both recalling a mysterious man named Wild Cat, who was his late partner in crime, and trying to find his lost love Wan Qiwen (Tang Wei), who left many years before. And then, about an hour from the end, our protagonist goes into a movie theatre and puts on 3D glasses, and at this point so do we in the audience. What follows is a stunning final hour that unfolds as a single take, presented in immersive 3D, that seemingly reimagines the entire film as a sort of fever dream. This sequence alone is one of the most audacious and dazzling things I’ve seen attempted in a movie recently, and it should to be seen in a theatre to get the full effect. As a character remarks at one point, the difference between memories and cinema is that memories change and cinema remains the same. This idea is explored through the way that different themes and moments keep repeating themselves and being reimagined throughout both halves of the film. Often unfolding on the wide continuum that exists between fiction and reality, Long Day’s Journey Into Night is a staggering, haunting and strangely moving mix of visuals and sound, immersing us in a world that exists somewhere between memory, dream and, ultimately, cinema in its purest form.